This is an equine psychology course providing the theoretical skills to underpin natural horsemanship and alternative horsemanship methods and related topics. Provides in-depth detail of equine psychology & behaviour with practical and written assignments resulting in a much greater insight, knowledge and understanding of how horses read us and how their minds work. The course will enable riders and owners to better understand and handle their horses and arm them with the skills required to approach problem behaviour in the correct manner. You will be amazed at how much you learn and how much you took for granted. Your tutor provides feedback and support – plenty of help therefore if you want a certificate. This course fee will be subsidised by Lingfield Correspondence for the near future. Equine Psychology & Behaviour is our most popular course – it provides theoretical skills to underpin natural horsemanship and alternative horsemanship methods and related topics. Provides in-depth detail of equine behaviour with practical and written assignments resulting in a much greater insight, knowledge and understanding of how horses read us and how their mind works. Total flexibility to fit in with your family and your life. Instalments available *Via UK Bank accounts only. Standing order set up is required prior to activation. Detailed form is provided when you complete checkout of first instalment payment. You have the confidence that the author of this course has BHS professional qualifications and personal experience. All our tutors have been there and done it – they speak from experience. 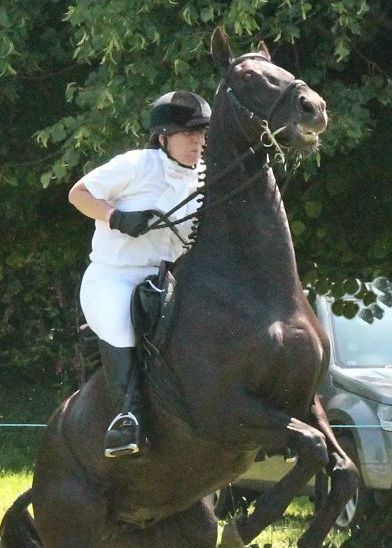 The Equine Behaviour course author and tutor Hannah, is a BHS instructor with a broad range of experience in running yards and training horses and riders. Hannah Haskew gained an BSc in Equine Science with a Psychology speciality and won the Eqvalan Thesis of the Year award in 2003. For her Masters Project Hannah researched the use of Kinesio Tape on horses hocks to see it could encourage greater flexion. Hannah runs a practice in Derbyshire and is a qualified Veterinary Physiotherapist. You also have security in the knowledge that Lingfield Correspondence has been a professional BHS based Training Provider since 1996. NOTE: When used as part of the Intermediate Diploma programme (ID3), provides the majority of the theory for Stage 1 & 2. ID’s offer subsidised fees & option of 4 certificates. READ MORE – Entry Requirements etc. Communicating with the horse – the how and why. “Problem” horses – what are they – why are they – what to do. What are “Horse Training” “Horse Training” and “Natural Horsemanship”?